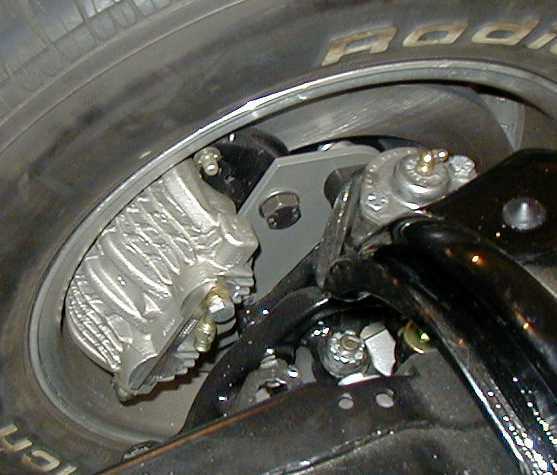 The 12" C4 brake info below was compiled before C5 Corvette swaps were introduced, a C5 rotor is 12" dia but wider with better venting and is highly recommended, also the LS1 and C5 calipers are better than C4. C5 and LS1 calipers should bolt to the C4 brackets below and work but I have no confirmation of this. I HAVE NO PERSONAL EXPERIENCE WITH THE INFO BELOW, IT WAS ALL SENT TO ME FROM CAMARO FORUM MEMBERS. I have recieved a message that these are the part numbers for 13" vette rotors. since they are left and right specific, they MAY be the curved vane heavy duty rotors and very desireable. 12"-13" C4 Vette brakes on first gen drum brake spindle. The 13" version is the best option with LS1 calipers. DISCLAIMER - Any of the info on this or any page here are as good as we know how to do, but may not contain all the information needed for a completely safe braking system. You are responsible for the safety of your brakes, proceed at your own risk. 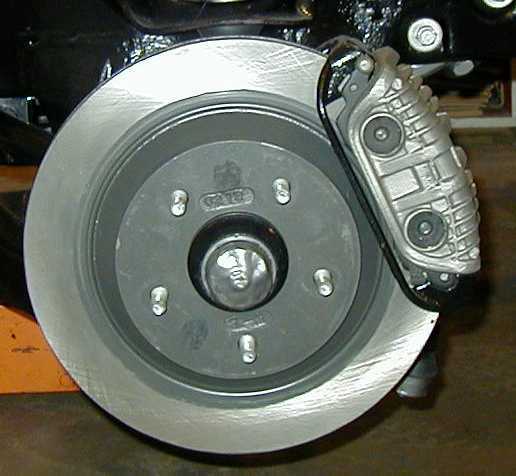 How to bolt 92-96 C4 Corvette front disk brakes onto your first generation Camaro. The following instructions assume you are starting with the original equipment first generation drum brake hub, spindle, steering arm, and bearings. The required C4 Corvette components are outlined on the included table and should be on hand when trying to attempt the installation. (Some trial and error fitting of components is required.) PLEASE NOTE: Although the installation is a bolt on, some grinding and crafty engineering is required. Corvettes between 1992 and 1996 had two brake options available, the 12" JL9 Standard, and the 13" J55 Big Brake option. On deciding which option to go with, a few things should be considered. One item is that going with the 13" rotor will not allow you to use 15" wheels or any aftermarket rally wheels due to caliper interference with the inside of the rim and/or wheel center. Another item is that the caliper will now stick out past the hub face and may require new wheels or modifications to your current ones for clearance. (Torque Thrust II's will clear without a problem, but Torque Thrust D's will not.) Now, decide what diameter rotor you would like to have, and order the corresponding calipers, brackets, rotors, and pads. 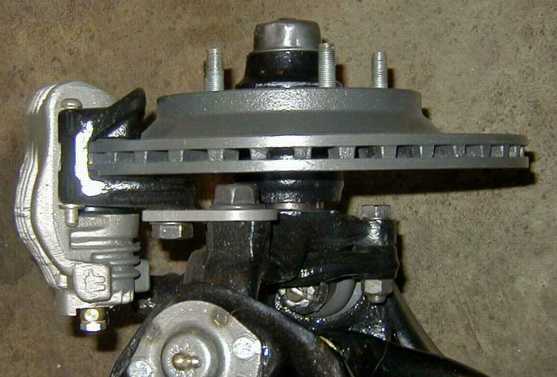 NOTE: The brake booster above is very hard to adapt to a first gen, it has a different bolt pattern, rod height/angle. I have been told booster GM # 18029982 is a bolt on. The custom adapter plate that I created for this swap will work for both the 12" and 13" conversion, but only if matching calipers and brackets are used. (ie. the 12" JL9 caliper and bracket with the 12" rotor, or the 13" J55 caliper and bracket with the 13" rotor.) I do not have the exact dimensions on the adapter plate, therefore I recommend measuring the distance between centerlines of your spindle bolt holes and enlarging/reducing the photograph until it matches. Then, take the paper template and glue it to some cardboard to make a mock-up part that can be tweaked until the caliper fits properly. At this point, mock-up the parts and check for concentricity of the brake pad to rotor and make sure the pad does not overhang the edge of the rotor. Finally, cut the custom adapter plate from 1/4" thick steel plate based on the mock-up part that you created. Metal finish and test fit the adapter plate, making sure it fits the same as the mock-up part. Now you can bolt the adapter plate and steering arm to the spindle using the OEM steering arm bolts and the threaded portion of the shoe pivot stud (after grinding off the upper stud portion making it resemble a regular bolt). 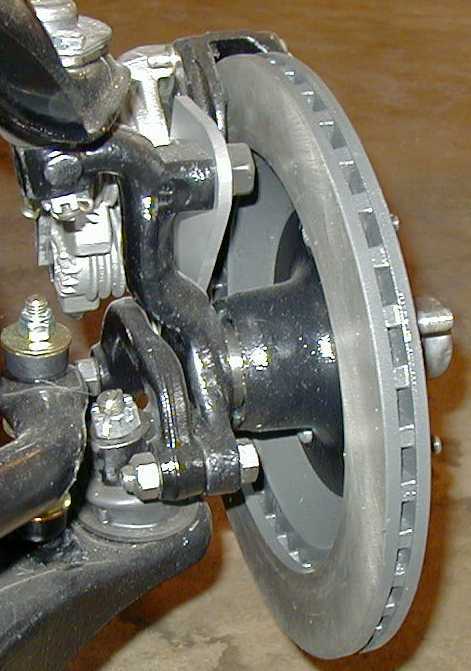 The modified drum brake hub can then be re-installed on the spindle in the factory manner. Next, install the rotor onto the hub with two or three finger-tight lug nuts. Now, attach the cast iron C4 caliper bracket to your new adapter plate loosely with the M14x2.0 bolts and measure the shim thickness required to center the bracket on the rotor. Add the required amount of shims (M14 flat washers) between the custom adapter plate and the factory caliper bracket and tighten it down. Slip the caliper into one end of the bracket and slide it down onto the rotor. Install the retainer pin and e-clip, then step back and admire your work. The C4 calipers require a 10mm x1.0 banjo bolt and a custom brake hose, which you can make with braided line and AN fittings, or have someone else make for you. I am not sure whether these calipers require a quick take-up master cylinder or not, but I plan on using a 94-97 F-car master cylinder and power booster. (The C4 Calipers have the same bore sizes as the late model OEM F-car parts and by installing 94-97 F-car rear discs brakes, should make a proportioning valve unnecessary.) I do plan to install a Summit adjustable proportioning valve on the rear brakes, though, purely for tuning purposes. New AC-Delco components can be purchased for around $550 for the 12" package, and $625 for the 13" package (the 13" rotors are uni-directional and thus more costly), excluding the brake hoses and miscellaneous hardware. This cost, however, can be reduced significantly by purchasing re-manufactured calipers, lower grade brake pads, and non AC-Delco rotors. Rich Downing can be contacted at rich_downing@hotmail.com for help or questions. While I am hosting this info on my page, I don't have any personal knowledge of this swap and can't answer questions on it. Please E-Mail Rich Downing for more info. If you have any corrections that may benefit readers of this page, please send them to me. Note the thinner than stock rotor. The LS1 brakes are better. So, there we have it. I'll have PN and pics soon, i'm working on my web site, t56kit.com and it will have all my products, and pics and install on it. * NOTE: here is a correction I was sent about the brake hoses. brakes on a 1st gen.
"You will also need a 98+ Fbody front brake hose, as these magically fit the stock hard line on first gens." part number 271300... I got a pair at OReilly's auto, and surely other places carry them. I just found this out b/c I read this info on the write-up page and went out and bought 98 F-body lines. Right is Brian's finished 12" bracket, the 6" marks are just for size, do not indicate the hole spacing. Increase or decrease rint out scale till the 6" actually measures 6" on your printout.